BUILT LIGHT. BUILT RIGHT. Never-before-achieved speed, power and protected mobility outside the wire. 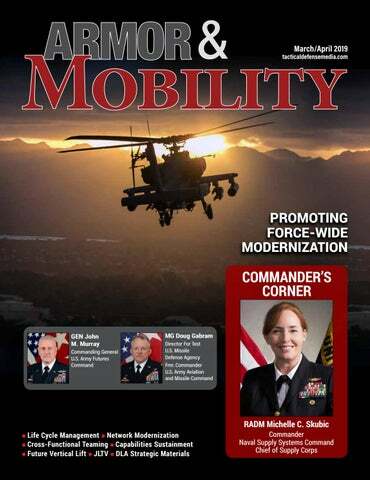 The March/April issue of Armor & Mobility gives us a look at Joint DoD efforts to modernize above and beyond proven legacy systems and prepare the world’s most powerful military for the future of combat. From network integration to life cycle management, what drives America’s military readiness is as much hardware as it is the men and women who make that hardware perform. With the advent of the U.S. Army’s newest enterprise, Army Futures Command (AFC), the globe’s most lethal land-based force is renewing focus on identifying systems and processes long proven effective, but on the verge of losing their effective application in a rapidly changing international theater of operations. In two exclusives to A&M, AFC leadership, to include Commanding General John Murray, speaks to primary challenges the Army continues to grapple with in staying on the cutting edge of force design, training and doctrine, and sustainment of materiel. The advantages of partnerships between government and academia in producing new test capability failures before capabilities become viable products, has become more critical than ever in saving DoD time and money. A big part of what is expected to comprise DoD’s 21st century Army is an integrated communications and data delivery system that keeps everyone from combatant commanders to combat soldiers in the operations loop. From real-world to training scenarios, weapons systems are only as lethal as they are operable. Without effective life cycle management, there is no telling when life cycle extent is reached. As such, Army Aviation and Missile Command (AMCOM) has developed a comprehensive plan to address Army initiatives in materiel availability and sustainment in support of future force requirements. MG Doug Gabram, former AMCOM Commander and current Director of Test, U.S. Missile Defense Agency, tells us that agile sustainment across system life cycles, as well as developing and executing Army investments in future force capabilities, remain top AMCOM priorities moving forward. Not to be overlooked, process improvements in supply chain efficiency to support increases in materiel demand due to changes in operational tempo are also front and center at AMCOM. In lockstep with Army logistics, the Defense Logistics Agency (DLA) Strategic Materials Team is working to provide DoD with safe, secure, “environmentally sound” sources, in many cases, American made. On the maritime front, this issue offers a look into U.S. Naval Supply Systems Command (NAVSUP) priorities as RADM Michelle Skubic, NAVSUP Commander, speaks to the latest in digital customer service and elevated technological capabilities to ensure supplies are there when and where needed. On the aviation side, we get insight into the Army’s Future Vertical Lift (FVL) program and its “Eco-System” effort to ensure future air operations are not only more effective but more fuel efficient, a critical factor in modern long-range global combat. DISCLAIMER: Tactical Defense Media (TDM) is privileged to publish work by members of the military and government personnel. We make a special effort to allow writers to review their articles before publication, critique our edits, and make changes. TDM typically follows, but is not bound by, the AP Stylebook and reserves the right to determine the style, including but not limited to capitalizations and other grammatical aspects, except in the cases where the style is dictated by military or DoD standards and practices. The U.S. Army’s newest modernization enterprise, Army Futures Command or AFC, is tasked with taking myriad assets of invention and innovation, whether in government, industry or academia, and helping them to help DoD build a 21st century-ready force. No small feat. Design of Experiments (DoE): Open innovation model enables use of unique Army and public-private resources to test, analyze, and validate applications of new MVP capability. Minimum Viable Product (MVP): The first “functioning fabric spectrometer” enables early DoE to generate feedback to refine and improve potential of new capability. Army-Relevant Applications: MVPs and DoE provide early feedback from Army capability developers and Soldiers. Potential uses include on-body injury prediction, altitude readiness, chemical exposure sensing, etc. • Meets MIL-STD 810G, 461E and F, 1275D and IP 67 Requirements. • Battery temperature compensated charging. • Fully Software Defined. Wide range of configurable parameters, ie output voltage, current limit, alarm limits, monitoring status, and firmware upgrades. • Active load sharing between unlimited units connected in parallel. Remotely control multiple ComPacts simultaneously. Custom power solutions also available. Harness the power of connection as you bridge the gap between commercial and defense to foster more collaboration, spark new innovations and advance our warfighters’ mission. NETWORK MODERNIZATION TARGETING MANAGEMENT AND SECURITY 2023, 2025, and 2027. Capability experimentation and demonstration driven by the Network CFT, and direct feedback from operational units and Soldiers will inform the detailed network design of each successive capability set. Maj. Gen. Pete Gallagher, director of the Network CFT, said this approach will ensure the Army accelerates at a rate at which it can steadily insert new technology solutions while enabling Soldiers with the best available capabilities. “Inserting technology in two-year capability sets provides flexibility to augment and integrate IT capability as it emerges from industry,” Gallagher said. “We will leverage Army and Defense science and technology, coupled with industry and academia’s research and development. Advances in commercial off-the-shelf solutions in areas such as waveforms, cybersecurity, satellite constellations and artificial intelligence are core to the success of this phased approach.” The initial phase, Capability Set 21, will make leap-ahead improvements in several tactical network areas with specific focus on improving expeditionary capability while making the network simple and more intuitive. This phase will deliver smaller, lighter and faster communications systems, and Soldiers will find that the applications and network devices are easier to learn and use. The first iteration of the Integrated Tactical Network, or ITN, will be fielded to select Infantry Brigade Combat Teams (IBCTs), air-ground integration improvements will be made through the use of gateways, and initial fielding of the Command Post Computing Environment (CPCE) will enable a common operating environment, another pillar of Army network modernization. Partnering on Mission The Network CFT is continuing to work in lockstep with the Program Executive Office for Command, Control, Communications-Tactical (PEO C3T) to develop and field these capabilities. The ITN, for example, has undergone several Developmental Operations (DevOps) iterations in which Soldiers are placed side-by-side with the developers to evaluate the technology and gather real-time, real-world feedback. “In contrast to other Army programs, where somebody that we’re not even interacting with decides what we need and pushes it down, the ability to work closely with the developers of the software and hardware has been great,” said Capt. Matthew Risenmay, higher headquarters commander for the 1-508th Parachute Infantry Regiment (PIR), which is currently experimenting with initial ITN capabilities. “If you don’t have contact with the people that are developing it, you run into problems and you have to deal with the problems for a long time.” The 1-508th PIR employed the ITN for a sixth time during major battalion exercises at Camp Atterbury, Indiana last month. Capability Set 23 will build upon advances in expeditionary capabilities to increase capacity and resiliency of the network while providing a more robust transport layer to support the requirements of the Army’s other modernization priorities. Fielding of the ITN to additional formations – Armored and Stryker BCTs – will extend the distance and range of units, also increasing mobility for maneuver. Units at the tactical edge will have more agile computing environments thanks to access to a tactical cloud. Mesh networking and hardening of radios will decrease vulnerabilities and susceptibility to jamming. Collaboration between the developers, acquisition professionals and Soldiers is key to infusing industry technology into the Army’s network design. Through experimentation and DevOps, the Army will continue to leverage Soldier feedback and insert commercial solutions into its network in Capability Set 25 with a focus on automation and protection. Deployed units will have more robust cloud capability, network management and decision making tools will become more automated, and network security will be augmented by new waveforms. “As we look five years down the road, we anticipate advanced cellular technology – such as 5G or an equivalent – will become accessible to formations to provide faster connectivity,” said Maj. Brian Wong, Chief of Market Research for the Network CFT. By fiscal year 2027, the Army’s insertion of commercial technologies in two-year phases will be fully institutionalized. Wireless connectivity will be increasingly hardened and the service’s network will have significant cyber improvements and protection. Automation capabilities inserted in earlier capability sets should have fully capable artificial intelligence baked in and will be machine learning enabled. Capability Set 27 will further advance non-traditional, spectrum-efficient waveforms while converging all warfighting function applications into a common operating environment. Moving Forward Join us for the 3rd Annual International Summit on Borders where global leaders representing a diverse cross-section of political leaders, practitioners, and stakeholders will convene to address homeland security challenges, transnational threats, and migration management issues. ADVANCING NEW CAPABILITIES STAYING AHEAD OF OBSOLESCENCE them. Thankfully, NASA was able to find the components needed, and the restored photos are preserved for history. But we cannot rely on chance and hope for critical weapon systems. By reactively managing obsolescence, issues are generally not found until a part or component is needed and a procurement request has been issued. By this point, the obsolescence issue can affect readiness and/or require an unbudgeted cost to mitigate the issue. On the other hand, proactively managing obsolescence involves monitoring the parts and components used to produce, maintain and repair a system down to the lowest possible level. Proactive obsolescence management does incur a cost to the Army; however, it also provides time for the weapon system’s design authority to develop, budget, and implement the most efficient and cost-effective mitigation prior to the obsolescence issue affecting weapon system readiness. hundreds of thousands of parts is reduced. Efficiency is also gained by internal controls to automate as much research as possible and by using standardized research processes for research that cannot be automated. An additional benefit of MORE is the cross-platform visibility feature, which allows users to see if a specific part utilized on their weapon system is used on other weapon systems. This provides opportunities for PMOs to potentially leverage previous obsolescence resolutions or collaborate on future obsolescence resolutions. The third aspect is continuing the AMC Obsolescence Best Practices IPT. No two Army programs are the same; they are in different phases of the life cycle, utilize different types of contracts, have different levels/types of repair, and a variety of mission requirements. Therefore, the obsolescence program manager has to tailor the obsolescence management strategy to the needs of the individual weapon system. The AMC Obsolescence Best Practices IPT provides the opportunity to share successes, struggles, and facilitates open discussions on how to continuously improve program management for individual weapon systems based on insight from other experienced obsolescence managers. The open communication also allows for continuous improvement for new ideas and methodologies for research, database management, and program management. Fourth, and finally, is communication and collaboration with the government and industrial workforce across AMC and DoD. The most effective and efficient obsolescence management teams include representatives from multiple organizations within AMC, the PMO, and industry. Within each weapon system the necessary representatives vary, but most include multiple individuals from the LCMC, PMO, prime and subcontractors and/or Army depots, and any other stakeholders based on their specific responsibilities to maintain the weapon system. The LCMCs are responsible for fielding and sustaining Army weapon systems. The PMO is the single point of accountability for accomplishing program objectives for total life-cycle systems management, and the prime contractors, subcontractors, and/or Army depots are responsible for various aspects of the weapon system’s production and/ or sustainment. To ensure the best mitigation at the lowest cost to the government is selected, these representatives need to understand what obsolescence is, why it is important and what can be done to manage it across the weapon system’s life cycle. With that thorough understanding, these individuals are able to assess the risk of obsolescence impacts in a timely manner and implement the most cost-effective mitigations. Army modernization is rolling forward, as the first Joint Light Tactical Vehicles (JLTVs) arrive in the field. In January 2019, 1st Brigade Combat Team, 3rd Infantry Division, accepted the first of its anticipated 350 JLTVs from the Joint Program Office, Joint Light Tactical Vehicles (JPO JLTV). Soldiers at Fort Stewart have been busy taking part in new equipment training for both operators and maintainers, giving them first-hand experience with the latest in tactical vehicle technology. “We are very excited to get these trucks into the hands of our Soldiers,” said Col. Mike Adams, 1st Armored Brigade Combat Team commander. “It’s an honor to be chosen as the first unit to receive such an improved capability, and I look forward to getting it into our formations.” The deliveries to Fort Stewart represent a significant modernization success for the Army and Marine Corps, as continues on-schedule and on-budget toward replacing many venerable High Mobility Multipurpose Wheeled Vehicles (HMMWV). In doing so, the JLTV will close an existing capability gap in Army and USMC light tactical wheeled vehicle fleets, while providing improvements in the balance of payload capacity, mobility performance, and protection, along with enhanced maintainability, reliability, and network connectivity. Beyond Initial Evaluation The JLTV program entered its Low Rate Initial Production (LRIP) phase in August 2015 with an award to Oshkosh Defense. Since the award, Army and Marine Corps leaders conducted numerous manufacturing assessments, developmental tests, and a Multi-service Operational Test & Evaluation event in 2018 that allowed the services to gain critical feedback from Soldiers and Marines. For the past three years, while serving as the Commander of the U.S. Army Aviation and Missile Command (AMCOM), Maj. Gen. Doug Gabram made it his personal mission to increase Army aviation and missile readiness. Daily checks on Armywide Aviation and Missile readiness rates, checking on the status of industry supply chain parts on hand, production redundancy and leading others to airworthiness solutions that maximized readiness are but a few of the myriad tasks Gabram carried out. Gabram relinquished command last month after three years at the helm to become the Director For Test, U.S. Missile Defense Agency, but the processes and programs he built improved sustainment and Army readiness. “We have to be ready to fight tonight,” Gabram was fond of saying. “And to do that, our aircraft and our missile systems have to be fully mission capable.” An aircraft or missile system that needs a part to make it fully mission capable is dependent on the supply chain to deliver that part. Building supply chain depth – and the resulting Army readiness it brings – is the legacy Gabram left behind when he relinquished command, February 14, 2019. Full-Mission Global Support AMCOM develops and delivers readiness to Soldiers and joint warfighters around the globe. AMCOM and the units under its operational control ensure that Army Aviation and Missile capabilities – which support nearly every Army operation across the globe – are available to meet the combatant commander’s requirements, wherever and whenever needed. In terms of Army commands, AMCOM is a relatively young organization stood up in July 1997, merging the Army’s missile and aviation life-cycle management commands. The organization grew in 1998 when AMCOM assumed operational control of Corpus Christi Army Depot and Letterkenny Army Depot. Then, in 2003, AMCOM assumed operational control of all aviation logistics management functions at Fort Rucker, Alabama. The Aviation Center Logistics Command was formally activated on Aug. 5, 2004 to provide quality aviation sustainment, logistics and materiel in support of the U.S. Army Training and Doctrine Command training mission at Fort Rucker; Fort Bliss, Texas; Fort Benning, Georgia; Fort Huachuca, Arizona; and Fort Sill, Oklahoma. AVIATION AND MISSILE COMMAND MANAGING LOGISTICS OF MATERIEL SUSTAINMENT In 2005, AMCOM joined with PEO Aviation and PEO Missiles and Space to form the Aviation and Missile Life Cycle Management Command, the first life-cycle management command, which provides integrated engineering, logistics and contracting support to more than 90 major support systems. Gabram assumed command Feb. 18, 2016. Under his watch, AMCOM established several processes that represented a departure from just-intime maintenance logistics the Army had defaulted to over the past 15 years: The first-ever AMCOM Campaign Plan, identifying the need and solutions for building supply chain depth; and engaging with industry partners to eliminate single points of failure and increase production, just to name a few. One of the first initiatives was to develop a comprehensive command plan, a framework to ensure capabilities are aligned with the required outputs to the Army. AMCOM’s Campaign Plan, developed in the spring of 2017, weaves the critical core competencies into effective, outputdriven lines of effort. These lines of effort serve as a roadmap to enable readiness, support the future force and provide trained, resilient and ready employees who are focused on delivering key outputs for the Army. “We are focusing on near-term priorities and requirements, but keeping in mind that we are supporting an ever-evolving Army,” Gabram said. “AMCOM will ensure that our time, money, workload and initiatives are focused on operational outcomes.” The campaign plan laid out AMCOM’s four main lines of effort. The first, “Sustainable and Materiel Readiness,” supports the Chief of Staff of the Army, Gen. Mark Milley’s, top priority, readiness. “We will always be ready to fight today, and we will always prepare to fight tomorrow,” Milley wrote in his intial message to the Army, in September 2015. “This LOE is focused on our strategic, operational and tactical sustainment goals,” Gabram explained. “It includes initiatives such as optimizing the supply chain, optimizing depot performance and divestment of excess materiel.” The second LOE, “Future Force,” addresses agile sustainment across the system life-cycle, as well as developing and executing Army investments in future force capabilities. The relationship and information sharing between AMCOM, PEO Aviation and the Future Vertical Lift Cross Functional Team (FVL CFT) is just one example of how AMCOM, as a lifecycle management command, is coordinating with other units to ensure future aviation platforms are sustainable. The third LOE is the “Human Dimension.” “We are only as effective as each individual member of our workforce,” Gabram said. “We are investing in developing and retaining a workforce of excellence, an adaptable team of professionals.” The command is comprised of more than 7,800 civilian and military employees. The majority are stationed at Redstone Arsenal, but AMCOM has employees stationed across the globe. The command worked hand-in-hand with the civilian career managers and military leaders to develop and implement several development programs to help employees grow professionally. “Our goal is to build flexible and adaptive leaders and multi-skilled Soldiers and civilians,” Gabram said. The fourth LOE is “Resource Management.” “Everything revolves around our resources,” Gabram said. “The command always did a good job of presenting the quantitative money requirements, but we weren’t doing a good job of outlining the quantitative requirements. We weren’t answering the ‘Why’.” AMCOM shaped the internal organizations, financial resources and priorities so that we had the right outcomes at the right time and the right cost for our Warfighters. The command now is able to show a direct correlation between AMCOM’s outputs and operational impacts. AVIATION AND MISSILE COMMAND MANAGING LOGISTICS OF MATERIEL SUSTAINMENT “For more than 15 years, we’ve been operating on a just-in-time basis. We must have depth and predictability in our supply chain to anticipate our Soldiers’ needs in a large-scale combat operation. A combat environment against a near-pear competitor will be much different than today’s conditions and it might occur at the same time we are conducting our current operations. To strengthen our position, we have identified key readiness drivers for every one of our aircraft platforms and missile systems.” AMCOM Logistics Center personnel identified the top readiness drivers for all of AMCOM’s Aviation and Missile platforms, and defined sufficient stock on hand. A readiness driver is a critical repair part that will deadline a system and is essential for equipment operation. AMCOM defines sufficient stock to be three times the average monthly demand with no backorders over 30 days. Identifying and stocking the readiness drivers are a means of prioritizing how to go after the goal of supply availability. Identifying the top 10 readiness drivers was a major initiative toward building supply availability. Sea-Air-Space is the premier maritime event in the United States. Join thousands of other senior leaders from the U.S. Navy, Coast Guard, Marines and Maritime Administration at Navy League’s Sea-Air-Space 2019. With over 15,000 attendees, 327 exhibitors, 40 international delegations and 9 HON in attendance, Sea-AirSpace is your destination for doing business with the global naval and maritime community! User is wearing the INVISIO V60, designed to be the ultimate communications hub and capable of connecting into practically any type of communications device. INVISIO system, as it allows for deployment of new equipment without the need for updating existing INVISIO equipment. All INVISIO systems feature INVISIO IntelliCable™, a unique identification that enables all equipment to be interchangeable across current and future INVISIO systems. Working closely with radio manufacturers, INVISIO enables integration with a multitude of legacy and new radio and network platforms. Our smart controllers and cable systems are compatible with many military-fielded, over the ear headsets. Combining tactical communications with hearing protection and enhancement is our core competency. Significant resources are annually invested in ensuring both speech intelligibility and situational awareness are effectively preserved in rugged, harsh, high noise environments. Multi-Need Comms Protection INVISIO Soldier and Intercom Systems are based on simplicity, modularity and flexibility to fit the communication needs of both the mounted and dismounted soldier, regardless of operational requirements. The INVISIO Soldier System is based on a range of control units and headsets that are fully interchangeable. All INVISIO control units allow for communication on multiple talkgroups on a single radio, as well as multiple audio inputs to enable full compatibility with modern team and combat net radios. INVISIO offers headset options that include in-the-ear and over-the ear hearing protection, 20 meters submersible and lightweight patrol headsets. The provided hearing protection is industry leading and offers state of the art situational awareness. 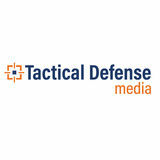 www.tacticaldefensemedia.com | download digital magazine today! Functional Team (FVL CFT). CFTs are now in full swing developing warfighting requirements, informed by experimentation and technical demonstrations, through teaming and rapid feedback from within Government, Academia, and Industry. mentioned, one-to-one correlation between a single AH-64 Apache and a single RQ-7 Shadow, limits an Aviation formation’s capability to mass its unmanned platforms and expand its areas of influence. A single unmanned aircraft can only influence so much. Automation Critical to Future Warfare The Future Vertical Lift “Eco-System” moves beyond the limitations of one-to-one correlation offered by MUM-T and exploits a one-to-many correlation offered by advanced teaming. The revolutionary nature of the Future Vertical Lift “Eco-System” resides in a game-changing capability offered by connecting a Future Attack Reconnaissance Aircraft to a heterogeneous network of multiple remotely controlled or automated unmanned platforms. The development of this capability is unprecedented and has particular application to our emerging MultiDomain Operations concepts and doctrine. A permutation of the Future Vertical Lift “Eco-System,” in line with our Air-Ground Operations tradition, which offers even greater capability in the future is a networked formation of manned and unmanned air and ground vehicles connected to fully autonomous unmanned air and ground platforms. The tactical and operational advantages offered by employing the Future Vertical Lift “Eco-System” include all the advantages of MUM-T plus the capability to rapidly synchronize and converge what would otherwise be the activities of disparate unmanned platforms, to include electro-optical/infrared reconnaissance and Electronic Warfare activities, into a singular effort aimed at penetrating a contested area, testing the enemy’s defenses, and establishing conditions to exploit an enemy seam or gap all while enhancing a tactical commander’s ability to dictate the terms of human contact with the enemy. The Future Vertical Lift “Eco-System” consisting of the Future Attack Reconnaissance aircraft, advanced unmanned aircraft systems, airlaunched effects, and future munition is the Reconnaissance-in-Force formation of the future will provide aviation formations, in support of ground maneuver elements, the capability to rapidly task organize, or coalesce and splinter, in order to adapt to and operate effectively within what we consider today as the highly dynamic and ultracompetitive battlefield of tomorrow. Visit Booth 124 at Global Force for a FREE sample of Zanfel. Zanfel Now Available in Individual Use Packets! Zanfel ® – a safer, faster and more effective option than steroids or antihistamines for relieving poison ivy, oak or sumac. Great for IFAK kitting! Great for Hospital and Battalion Aid Station Settings! Call 800-401-4002 or visit www.zanfel.com. Zanfel is a product of Zanfel Laboratories, Inc. ©2019 All rights reserved. U.S. Patent No. 6,423,746, No. 7,008,963. Additional patents pending. Zanfel and the Zanfel logo are copyrighted and trademarks of Zanfel Laboratories, Inc., Dakota Dunes, SD. COMMANDER’S CORNER critical factor in providing warfighters the parts they need at an affordable cost, especially when they will need them for decades to come. We also need to ensure our support strategies are able to adapt to evolving technologies. As we move toward a future where additive manufacturing (3D printing) capabilities can produce military specification (MILSPEC) grade components, we need to have reliable access to technical data to take advantage of this emerging technology’s potential to enhance supply chains. New technologies have the potential to unlock incredible ways to support our warfighters faster and more efficiently. We must aggressively explore these opportunities and work to adapt them to enhance Navy logistics and sustainment support and, ultimately, improve readiness and lethality. A&M: As the Commander, NAVSUP and Chief of Supply Corps, do you have any special goals you would personally like to see accomplished in the command and the corps? RADM Skubic: The NAVSUP enterprise has a global reach to deliver the materials warfighters require for their aircraft, ships, and submarines and their associated weapon systems to fight tonight and sustain tomorrow. Combined with the Supply Corps, NAVSUP has a substantial opportunity to strengthen every corner of the Navy. My goal at NAVSUP is to challenge everyone to have an operational and enterprise mindset. It is particularly important that we have this mindset since NAVSUP Headquarters assumed responsibilities closer to the fleet with the disestablishment of NAVSUP’s Global Logistics Support (GLS) Command. We need to be more operationally focused as we work arm in arm with the Fleet Logistics Centers and the teams that support the warfighter each and every day. The more our capabilities are understood by everyone across the NAVSUP enterprise and Navy, the better we will be able to support the warfighter. Another of our goals for the Supply Corps is for junior officers to fully understand where they fit into the larger picture of Navy and Joint force logistics. One of the ways we will accomplish this goal is by developing a course for Lieutenant Commanders that focuses on force development, the optimized fleet response plan, acquisition, the integrated supply system, ethics and strategic thinking. We are currently working with Center for Service Support (CSS) to develop the course that the Navy Supply Corps School (NSCS) will deliver to our officers. Topics that blend technical issues with broad leadership principles are critical in developing future Supply Corps leaders. 300+ displays, product demonstrations and industry briefings covering the latest in emerging military equipment, vehicles, technology and training systems. Register to attend or learn more at marinemilitaryexpos.com Show is not open to the general public. Appropriate attendees include U.S. military, law enforcement, industry and consultant representatives. Foreign military and student organizations are also welcome with prior registration. Raytheon Company’s evolving 65 plus-year-old Standard Missile-3 is bigger, more capable, and most importantly, more versatile to address intelligent threats. By Dr. Mitch Stevison, Vice President, Raytheon Strategic and Naval Systems Ballistic missile threats continue to advance, and in the same way, the Standard Missile-3 is evolving with the help of innovative engineering. A “crawl, walk, run” development approach that builds on proven systems has created an unparalleled ballistic missile killer. It destroys shortto-intermediate range ballistic missiles in space by colliding with its target – like hitting a bullet with a bullet. The SM-3 is the only missile in existence today that can be launched from a ship at sea or from land, offering extraordinary versatility to the warfighter. The advertisers index is provided as a service to our readers. Tactical Defense Media cannot be held responsible for discrepancies due to last-minute changes or alterations.